Is the Philippines a "small country"? ST. LOUIS, MISSOURI - Contrary to what many people, including myself, have always thought and believed, the Philippines is not a small country. In this essay, I survey some of the reasons why the Philippines might be conceived as “small” and present rebuttals, informed by the premise that size is relative: like any kind of measurement or measured quantity, it implies a reference point. Thus, crucial to understanding the way we look at our country’s size are the reference points that we have used in our measuring. Is the country, in fact, geographically small? With a land area of 343,448 square kilometers (higher than the common estimate of 300,000), our country is bigger than Italy (294,140 sq. km), and is significantly larger than Great Britian (229,848 kms). Mindanao alone, at 97,530 sq. km, is by itself is bigger than Ireland., which measures 84, 421 sq. km. The Philippines, moreover, is bigger than North and South Korea combined. Indeed, ranked among all the nations of the world, the Philippines belongs to the upper 1/3 in terms of land area. So how come there’s a perception of being “small”? One factor that may have skewed our perception of our country’s size is the use of Mercator projection in most maps. This projection - which is literally the most common “world view” available to us - exaggerates the size of countries the further they are from the equator. 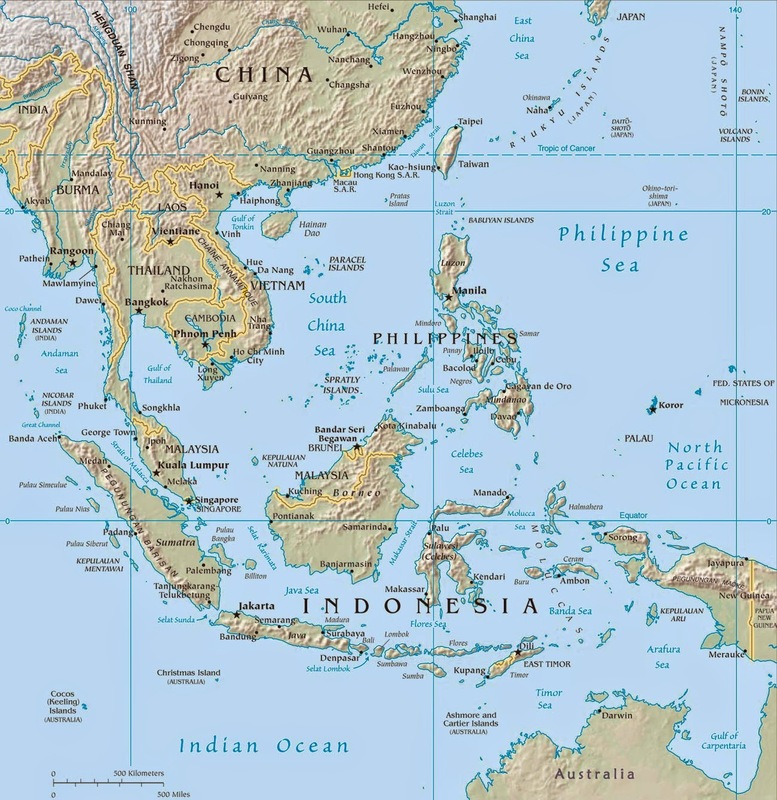 Thus they depict the Philippines and other places like India and Africa as smaller compared to their actual sizes, while places like Europe, United States, Canada, and Greenland look much larger. This projection, which was conceived in Europe at the dawn of its colonialist enterprise, has consequently been critiqued as “racist”, and though this is most likely just a side effect (there’s really no way to perfectly avoid distortion in maps), now we know better. Another factor is the refrence point with which we measure our country’s size. Doubtless, we are smaller than the United States - or even just California. But we do not have to use it as our standard. I doubt if the British would think their country as “small”, and neither would, I suspect, the Italians or the Koreans. A country’s size can also be measured by its population, and by this measure, the Philippines is actually one of the largest countries in the world. With around 100 million people, our country ranks 12th out of over 200 nations and dependencies, making it “larger”, by population, than France, Germany, Spain, or even Canada or Australia. Whenever I introduce the Philippines to colleagues abroad, they are shocked to hear how large the country’s population is. Population size can help nations project influence in the global stage - and is in itself a marker of power. Long before it emerged as a major economic force, China’s prominence in the world stage drew, at least in part, from the fact that it was - and still is - the world’s most populous nation. There are, of course, problems with overpopulation - which are beyond the scope of this piece. But it would suffice to say we cannot think of the Philippines as “small” by this measure. Could it be that we think of ourselves as small on the basis of our perceived insignificance on the global stage? Again, there are many points that belie this view. Just like area and population size, cultural “signifiance" involves a reference point. Have we been comparing ourselves to America? We should balance our regard for Hollywood with the fact that Filipino teleseryes are actually being shown - and admired - in countries like China, Cambodia, Malaysia, and even Zambia in Africa. Besides, who defines what is “significant” or not? The problem here is that we have been looking at our own country through the lens of others. An American textbook might probably just have a passing reference of the Philippine-American War, but such omission does not deny the gravity and impact of the war. In this multipolar world, we need to assert our voice through art, literature, journalism, and scholarship, and by ourselves, as embodied bearers of our flag. We also need to realise that in many fields, “smallness” is a matter of choice: surely, we can win an Olympic gold if our government makes sports development a priority. As is often the case, all it takes is for us to put our act together. Thinking of the Philippines as a “small country” can foreclose possibilities, and in the process, reinforce whatever reasons people have for thinking that we are “small" in the first place. It can make us feel needlessly “inferior” in the global stage, and can end up becoming a (lame) excuse for hopelessness and mediocrity. On the other hand, our non-smallness has implications, too. In foreign policy, it should motivate us to act with leadership, both in the ASEAN and beyond. Also, we can not use our "smallness" as an excuse to rely on others for security. On a personal level, it should inspire confidence wherever we are. Perhaps what may be more accurate is for us to think of ourselves as a young country: one whose nationhood is of relatively recent vintage. Smallness is static, but youth suggests vitality, development, and yes, growth. Thinking this way can provide us with the optimism we need to face the challenges of our time. Indeed, we are not, by any measure, a small country. This realization should make us stand tall as a proud nation among the nations of the world.